Dimensions: 81L x 43W x 56H in. 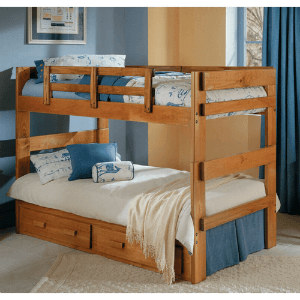 Perfect for shared rooms or hosting many sleepovers, this Woodcrest Heartland Split Bunk Bed - including slats features a twin over twin bunk bed. Its clean lines and select finish options ensure this bunk bed works in any color or style of bedroom. May be split to form two twin beds. Drawers shown in image not included. 81L x 43W x 56H in.